PD-6 and PD-12 Precision Demultiplexers. Six and twelve channel DMX analog converters. QD-2000 Dimming Control System. Converts 96 channels of DMX 512 and DC analog to 96 channels of 0 to 10VDC analog output. 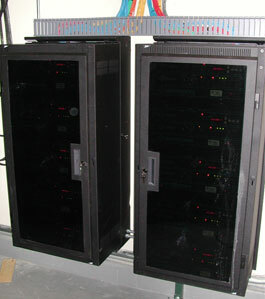 Standard 19" rack mount units support all Johnson Systems controls permitting low cost architectural features such as DMX snapshots, after hours power management, real time system status indication and much more. Networking supports larger systems into the hundreds or thousands of channels. CD-2000 Dimming Control System. Converts 96 channels of DMX512 and DC analog to 96 channels of pulse width modulated (PWM) output for direct solid state relay control. 19" rack mount enclosure supports all Johnson Systems controls permitting low cost architectural features such as DMX snapshots, after hours power management, real time system status indication and much more. Networking supports larger systems into the hundreds or thousands of channels.